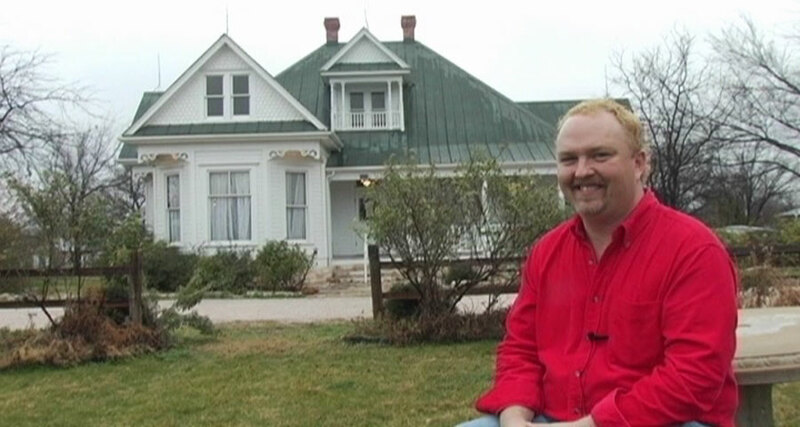 Michael and I spent a day at The Antlers in Kingsland, TX with free reign to roam around in the original Leatherface house. Originally, the idea was to drive out there and take a few shots of the house. But after Michael and I hit it off, talking about all things Saw, Michael decided to expand the shots into another chapter for the documentary by having me do an on camera tour of the house along with a sit down interview about the history of the house, my web sites and the fan club. I have to commend Michael for his skill and experience as a cameraman, an editor, and all around producer. He was very instrumental in making the shoot work for a guy, like me, who has never done anything like this before for a camera, and still come off well. My hat's off to him again! Something else must be said about the on camera tour we did of the house. There have been some reviews about Flesh Wounds saying that the tour I gave on camera was redundant to Gunnar Hansen's tour that is also a special feature on the TCM 2-disc ultimate edition. The tour that Gunnar gave was done in 2000, when we took David Gregory, Gunnar Hansen and the Shocking Truth crew to Kingsland. That tour never made the main feature of The Shocking Truth in its original form on VHS in 2001. Nor was the video even available in the states until now on DVD in 2006 as a special feature. So, at the time that Michael and I did the tour in April of 2006, we had no idea that Gunnar's 2000 tour would resurface as an extra for the DVD set. So the tour I did of the house was, in no way, supposed to be redundant on the DVD set. We simply thought that the tour should be on there because it had not been done before for the masses. If we knew that Gunnar's tour would be a special feature on the DVD set, chances are that we might not have done the tour in the first place. Michael's goal, from the very beginning of this documentary, was to do what The Shocking Truth had NOT done before, and cover areas of the TCM phenomenon that had yet to be brought to light. I will always be thankful to Michael for allowing me to appear in this well done documentary.